More search tools & help Images, data, DSpace, etc. Dome MIT-digitized images, maps, etc. Circulation FAQ Info about fines, renewing, etc. Visit non-MIT libraries Harvard, Borrow Direct, etc. Productivity tools Apps, RSS, etc. Citing sources Avoid plagiarism, format references, etc. 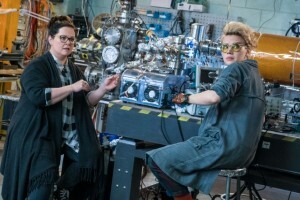 Several MIT researchers had a hand in boosting the “geek cred” of characters in this summer’s Ghostbusters reboot. Physics faculty members Janet Conrad and Lindley Winslow, along with former postdoc James Maxwell, lent expertise and props to the set — including actual books, posters, and models from Conrad’s office and “a mess of wires and magnets and lasers” from Maxwell’s lab. Winslow, who told MIT News she “probably put in too much time” working on the film, wrote a series of physics equations that appear in a classroom scene with Kristin Wiig’s character. Explore Professor Conrad’s research and Professor Winslow’s research in the Open Access Articles collection in DSpace@MIT, where it is openly accessible to the world. Since the MIT faculty established their Open Access Policy in March 2009 they have made thousands of research papers freely available to the world via DSpace@MIT. To highlight that research, we’re offering a series of posts that link news stories about scholars’ work to their open access papers in DSpace. Licensed under the Creative Commons Attribution Non-Commercial License unless otherwise noted. Notify us about copyright concerns.